With so many speakers out there, both floorstanding and bookshelf, it can be hard to narrow down a potential audition list, or to decide which design is more suitable for you. Unfortunately there is no blanket rule that makes one better than another, and most speakers will perform differently in different rooms and hi-fi systems. Before I begin, bookshelf speakers will virtually always perform better on speaker stands, which is why we’d prefer if they were always called “standmount speakers”, but the name bookshelf speakers seems to be what people have settled on, so who are we to argue?! There are many great bookshelf speakers out there at the moment generating a lot of buzz. The KEF LS50 has been the king of the hill in recent years, and has won virtually every award going for speakers. The Q Acoustics Concept 20 have also been not only a best-seller here at Audio Affair, but a stunning set of speakers and award-winning. A lot of truly reference level systems that we have seen, set up and sold tend to use floorstanding speakers. In a system costing tens of thousands of pounds it is unlikely that annoying the neighbours is a consideration, and so the impressive soundstage and bass dynamics of floorstanders is preferable in really unlocking the hidden detail and magic in your favourite recordings. A reason that budget and even mid-level floorstanders are not always first-choice is the difficulty in preventing the cabinet from colouring the overall sound of the speakers. The larger cabinet is what gives the floorstanders its improved bass and soundstage, but it is a challenge for speaker designers and manufacturers to design neutral cabinets which do not colour the sound in any respect. The KEF LS50 for example, as a bookshelf, has an incredibly neutral cabinet, and with less material to neutralise than a large floorstanding speaker, can focus on delivering an accurate and engaging sound. It is for this reason that few equivalently-priced floorstanders can come close to sound quality. Very high end models dedicate a lot of effort into preventing cabinet colouration, and for the most part are able to iron out the issues that plague cheaper floorstanders. Without the need to appeal to those on a tight budget, and able to truly focus on a no-expenses spared approach, the majority of truly high end speakers are floorstanders, and in an ideal world with no budget limitations or design constraints, this design is superior. The KEF Blade for example, KEF’s concept reference loudspeaker as well as many of ProAc’s Carbon range and reference speakers all opt for a floor based design. KEF’s stunning reference speaker: the Blade! Floorstanders have much larger cabinets than bookshelf models, and can typically generate greater bass response and extension. Soundstage is typically greater on floorstanders – this is the way the music is flung into the room and the immersion you feel in your music. Hearing sound left and right in an almost holographic fashion is the hallmark of a speaker with good soundstage. Good soundstage will give the impression of a three dimensional sound in front and around you, rather than it being very obvious that your music is in the room and coming from one area. Some speakers will give the impression that your music spreads further than the boundaries of the room, which can be a truly magical and immersive listening experience. 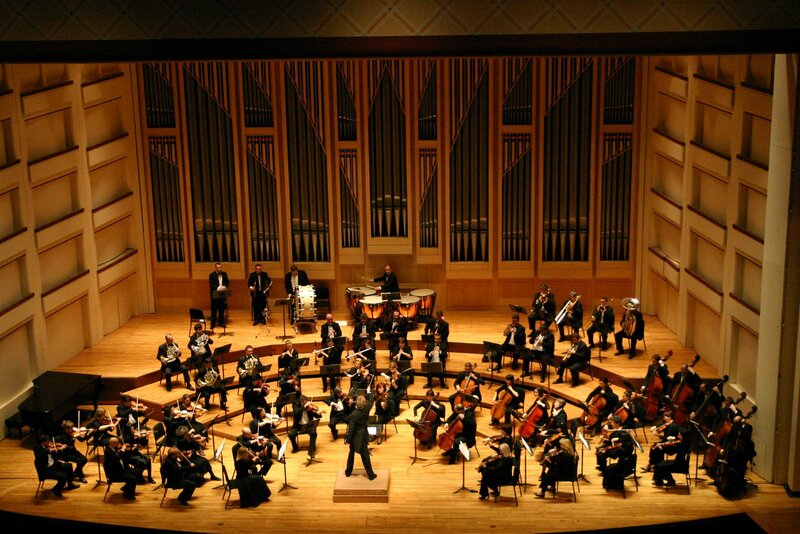 A good soundstage can give the impression of a whole orchestra in your room! Bookshelf speakers will often be described as having more “attack” and “speed”, so may deal better with complex musical arrangements and higher frequencies thanks to typically less bass and less cabinet colouration affecting the sound. 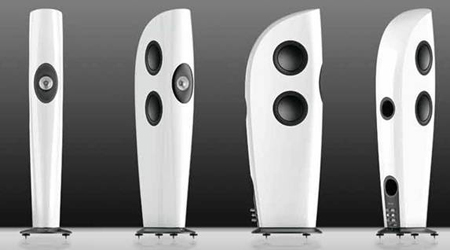 Bookshelf speakers are also seen to offer greater imaging. This typically goes hand in hand with soundstage, but affects the separation of instruments and the ability to hear every sound distinctly rather than one big muddle of sound. This might be a refrain from a violin or the melody played by a keyboardist in a band. A speaker with good imaging will allow you to hear this distinctly. Every speaker is different, and some floorstanders will image better than certain bookshelf speakers and offer more attack etc. However, as a general rule, bookshelf speakers tend to offer better imaging and more integration and coherency, while floorstanders tend to offer greater bass depth, dynamics and soundstage thanks to their design. 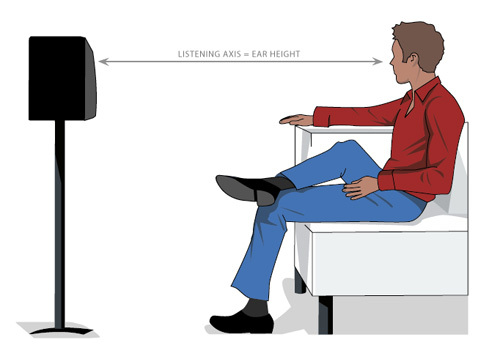 The ideal listening height for speakers is for the tweeter to be at ear level for your seating position. So if you sit back on a sofa when listening to music, your speakers should ideally be positioned so that a straight line can be drawn from the tweeter to your ears (see picture). This might seem insignificant, but this helps to achieve the optimum integration between high frequencies and lower frequencies. If you turn a speaker to face away from you, the sound will deteriorate and detail will be lost. The same principle applies to tweeter height and speaker placement. Bookshelf speakers offer more positional flexibility than floorstanders in this regard. The tweeter on a floorstander is fixed in height, and so it either has to be suitable for your listening room or you have to adjust around it. However, with bookshelf speakers, there are a wide range of speaker stands available in varying heights, with some manufacturers even offering bespoke custom dimensions to suit your purposes. This means that you can build your hi-fi around your existing room rather than the other way around, making bookshelf speakers more flexible. The bottom line is that there are generalisations that can be made, but speakers are all different, and will interact differently with your gear and room. – Bookshelf speakers are more agile and capable of complex rhythmical arrangements. They offer more positional flexibility due to being able to pair them with a range of stands in different heights. Imaging is superior with bookshelf speakers. – Floorstanders typically have better bass response and so are better as the front channels in home cinema systems and offer a more well-rounded sound for music. The soundstage is usually larger with floorstanders. Floorstanders cabinets are tuned to offer the best sound, while speaker stands may need some tweaks and experimentation with filling to really perform at its best. Hopefully we’ve managed to give you a more honest opinion of exactly what’s right for you, but if you are unable to demo your speakers, then the below recommendations are some of our personal favourites in their respective price brackets and those we always encourage customers to demo in our store. As mentioned, the bookshelf tends to be more popular until the price starts to get quite high, and this is a selection of real award winners and superstars!